"Guard hairs distinctly silver-tipped giving the cat a silvery sheen or lustrous appearance. A definite contrast should be noted between ground color and tipping. Free from tabby markings. Nose leather: slate grey. Paw pads: lavender pink or mauve. Eye color: vivid green." Russians have a short coat which is dense, fine, and plush. This double coat stands out from the cat’s body due to its density. It has a velvety soft and silky feel. The Russian requires a minimum of grooming with only periodic nail clipping and a coat that is easily maintained by frequent petting and an occasional brushing. Many Russians enjoy being combed or brushed and this helps create a stronger bond with their owners. 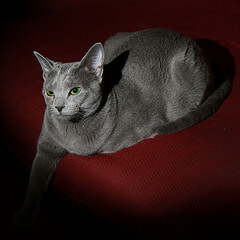 Russian Blues are sweet tempered cats. Quiet and clean, these beauties are playful and loving companions. They get along well with children and other pets. Not an extremely outgoing cat, Russians are none the less very loyal and very affectionate towards their humans. It’s not at all uncommon for this curious cat to open doors or drawers, and be found happily playing a game of fetch with kids or even by itself! Sensitive and intuitive, a Russian will playfully do entertaining antics to calm a crying baby and it would not be uncommon for your Russian to sit patting your face and nose or hugging your neck to make you feel better when you’re feeling sad. The Russian Blue cat has a short, dense coat, bright blue in color with the appearance that each hair has been dipped in silver. The end of each guard hair has a distinct silver color. This silver tipping gives the Russian Blue a unique silvery sheen and an almost luminous appearance that can be absolutely stunning when seen in natural light. The density of the Russian’s coat causes it to stand out from the body and like finest velvet, shows patterns of tracing where it is touched until the coat is smoothed again. The mesmerizing, emerald green eyes are large and round and set wide apart and the ears are large and wide set as well. As its name would indicate, this cat is of Russian origin; Rumor has the Russian Blue as a descendant of the Royal Cat of the Russian Czars and as a favored pet of Queen Victoria. And why not? With large, rounded, wide-set vivid green eyes, the Russian Blue is one of the most good natured, regal and striking cats to see. And just to add a bit of Mona Lisa mystery, the Russian’s face seems to be smiling and they’re not about to tell us humans why! This breed loves calm and established patterns of living. It hates noise, change and surprises. 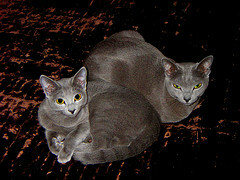 The Russian Blue is a gentle, affectionate cat though and can be a wonderful and loving companion. This cat is happiest in a quiet, calm atmosphere and fits perfectly into today's busy schedules. Because of their undemanding nature, they tend to entertain themselves if left alone for the day and still be calm and happy to see you when you come home.